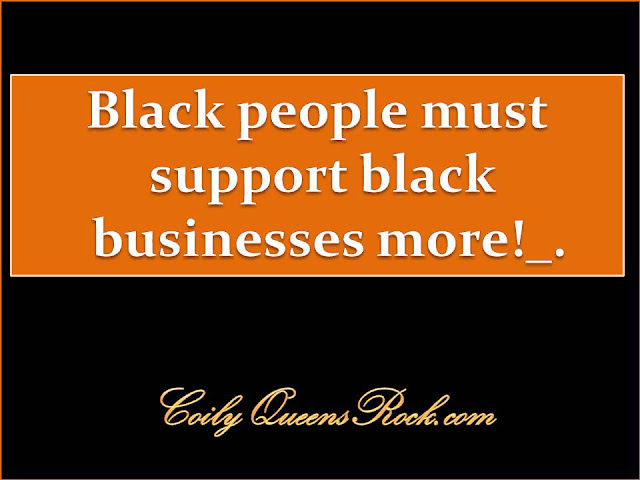 Knowing this you should understand how important it is that we support black owned hair businesses, black beauty brands, black youtubbers and black owned hair care websites. 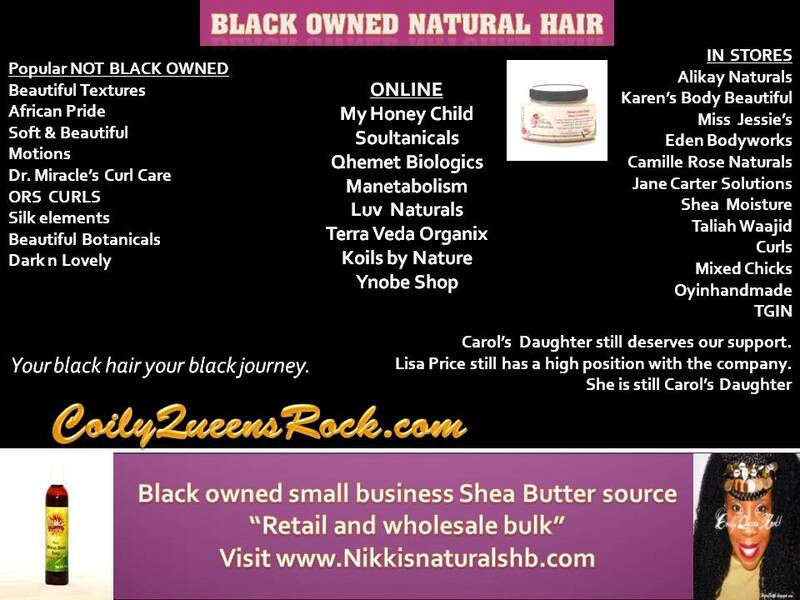 Yet we are promoting, sometimes unknowingly, websites which feature black hair yet they are not black owned. Surely on your Afro hair journey you would want to give your most support to those brands which put your hair and beauty first, not second. Some of you would be surprised at the brands we promote that are not black owned. It does not make sense $$$ to popularize non black owned hair sites and dismiss your hard working black sisters hair site. No other groups does this besides us. It is your black sister who has helped you the most on this natural hair journey, so let her know you appreciate that help. Let's support and uplift black owned brands and websites more than we currently are doing. Sites you often frequent and promote that are not black owned. Naturallycurly.com is a popular shared website that is NOT black owned. THE CURLY GIRL METHOD BOOK WAS NOT WRITTEN FOR AFRO CURLY HAIR. IT IS YOUR MONEY YOU CAN SPEND IT WITH WHOM YOU CHOOSE. THIS INFORMATION IS FOR THOSE WHO KNOW AND UNDERSTAND THE IMPORTANCE OF TO WHOM YOU GIVE YOUR MONEY. THIS INFORMATION IS FOR THE BLACK WOMEN WHO FIND IT IMPORTANT TO SUPPORT AND UPLIFT BLACK BUSINESS OWNERS. THEY NEED YOUR SUPPORT AND WE NEED EACH OTHER. My problem, why are they so expensive? For my hair, it requires a large amount of conditioner to detangle my hair.. .like a tresseme bottle which costs little, but for the same as a black business, I gotta shell out 20 bucks or more...just for a smaller size, and the bottle only takes care of two sections of my hair. It should not take that much product to detangle your hair. Water is what is doing most of the work. So get a bottle of warm water with your more expensive product then you will save a whole lot. Also consider many of the brands I listed have way better ingredients than Treseme. There is a reason that big bottle is cheap. The better ingredients will always cost us more. Just like with our foods. You can also make a cheaper healthier detangler with glycerin and oils. I do list the treseme as a good detangler for removing braid tangles. But you know what I rarely use my bottle of treseme. What we use to detangle will seep into our scalp. I do not need anything getting in the way of my hair growth. I might eventually remove the tresemee from this blog and replace it with the CQR super detangler. I am trying out that detangler right this second... so far it's been smoothing down the roughest sections of my hair which is very exciting, as it's doing it from root to tip, I will keep you updated. Also, thanks for making the comment section available again. I joined the site, but no matter what it kept saying i didnt have permission to do so. Hello Miss Vee, first off let me say thank you for all of the information you share. It really helps me. Secondly, it's actually kinkycurlycoilyme.com. Have a blessed day Queen. Thank you, and you are most welcomed. Have a blessed day today and always! Thanks for reading! HELP my hair is a tangled mess!!! Red Palm Oil and Afro hair care.